Electronic Arts (EA) and Amazon have been the targets of a justified online rebellion the last couple weeks. The impetus for the backlash is EA's use of Digital Restrictions Management (DRM) technology in its game Spore. As of right now, the game has received 2,226 1-star reviews on Amazon -- more than we've ever seen before -- and they are primarily focused on EA's DRM system. DefectiveByDesign members have tagged the game with tags like defectivebydesign and drm infected. As with music and video, this system controls how many copies a user can make of her game, and requires that she allow her computer to phone home periodically to an activation server to be granted permission. The system is called SecuROM, and while that name might not be familiar, there are familiar names behind it. SecuROM is a product of Sony DADC -- the same Sony that had to reach a settlement with the Federal Trade Commission last year over the rootkit installed by their noxious DRM. EA, forced to respond to the complaints, has done the minimum amount possible to try and make the heat go away. Their upcoming game Command & Conquer: Red Alert 3 will restrict users to five copies instead of three, and will enforce the phone-home requirement when the game is first installed rather than later on. But they have not changed the fundamentals of the system. Their "concession" is just more proof of the problems with DRM -- the ability of EA to arbitrarily decide how a user can use software on her own computer, and to make a part of her own computer off-limits so that it can spy on her in order to make sure that she abides by their restrictions. Requiring online activation on installation at all means that once the activation servers are shut down (as has been threatened all too often lately with music services like MSN and Yahoo), users are out of luck. Activation also doesn't mean what you might think -- the Amazon reviews are full of horror stories about failed activations after adding new components like video cards and disk drives to an existing computer. The packaging and advertising for Spore of course does not mention its DRM. When people find out about it, they don't want to buy it. The only way people are going to hear about it is if they hear it from you. 1. 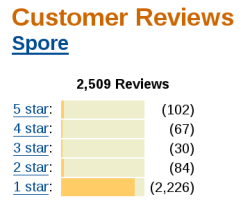 If you're already an Amazon customer, go to the product pageand add your own rating then review Spore, and tag it defectivebydesign and drm infected. Reviews aren't open for Red Alert 3, but you can still tag it and add information about DRM to its discussion forum. 2. Write directly to EA's CEO John Riccitiello at <jriccitiello@ea.com> to tell him that his response misses the point -- you will not be bought off by the ability to make two more copies than you could before. EA should act like true leaders in game design by getting rid of DRM once and for all. CC us at info@defectivebydesign.org. 3. Support DRM-free games like those based on the recently announced free software game Hexen. Suggest more DRM-free games that we can add to our Guide, by emailing us at info@defectivebydesign.org. The more support we can show for these games, the more there will be. Much like what happened with Digg and the AACS encryption key, Amazon after initially taking many of the reviews down was forced by public pressure to put them back up again. This is because there is nothing abusive or wrong with these reviews -- they are honest criticisms of an abusive technology used by far too many proprietary software game companies. We can have the most success here if we keep things that way, and don't give Amazon any justification for removing them or EA reason to dismiss them. It's been exciting to see awareness of DRM already rising to such a high level. Congratulations to all the DefectiveByDesign activists and other reviewers who made this happen. Let's keep this momentum going until all game companies do the right thing and eliminate DRM!